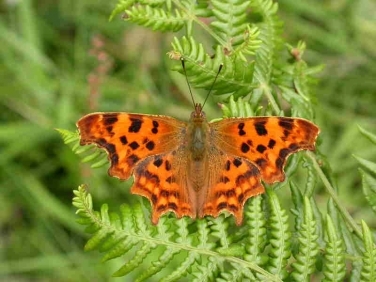 The Comma butterfly is a common British butterfly and one of the most easily identified species when seen settled. 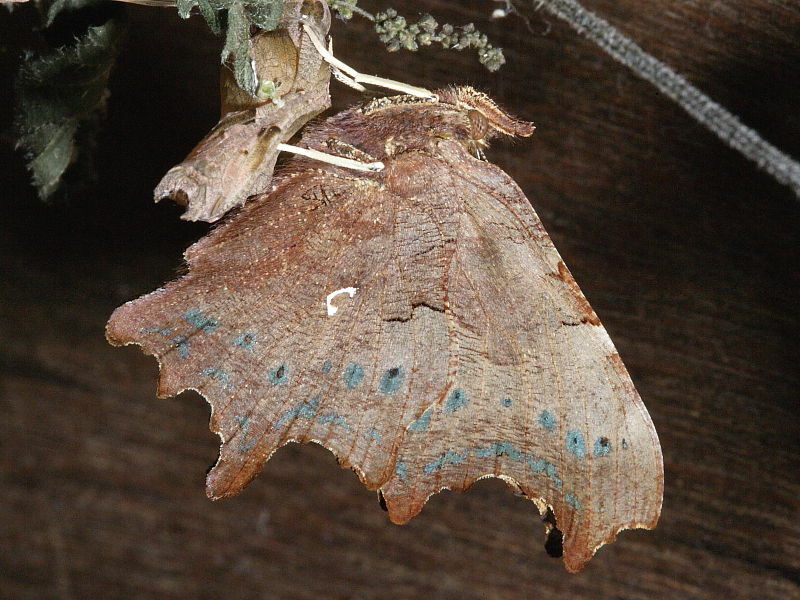 It has a wingspan of up to 50mm with jagged edges to both fore and hindwings. When settled, with wings closed, the dark broken outline of the butterfly blends in cryptically with its surroundings making it very difficult to see. 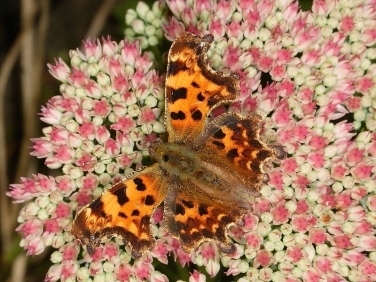 Located in the centre of the underside of the hindwing is a tiny white mark which resembles a comma punctuation mark, from which the butterfly derives its name. The upper side of the wings are a deep orangy brown with black markings and when in flight its fast wing beat interspersed with twisting glides can be confused with a fritillary butterfly. The female Comma is a little larger than the male which has slightly more ragged edges, a feature that can be difficult to assess in the field or with worn specimens. 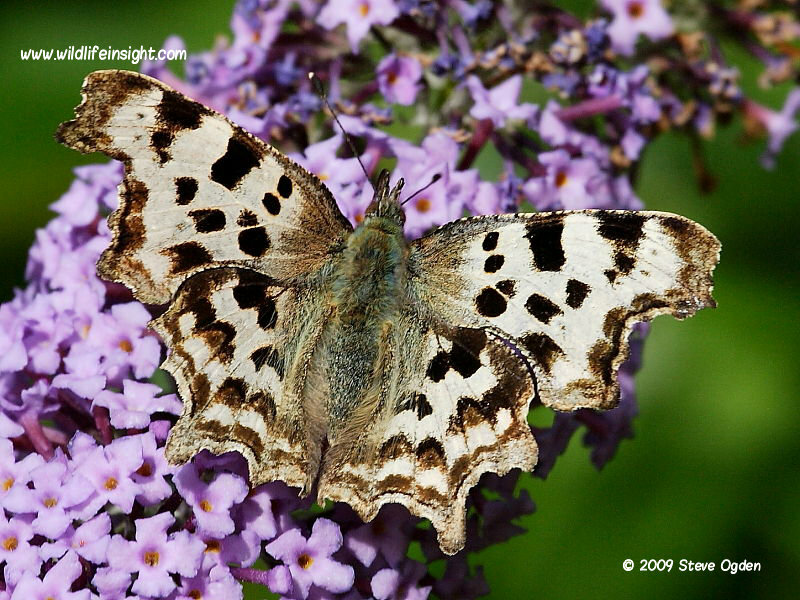 The hindwing of the female is also plainer and darker than that of the richly marbled males but both sexes have the little white ‘comma’. Other butterflies commonly seen in gardens are The Red Admiral, The Small Tortoiseshell, The Peacock The Painted Lady,, The large White, The Small White and Green-veined White. The form hutchinsoni are a brighter orange and are quite commonly found amongst early first generation butterflies in June and early July. This form do not hibernate but produce a second generation which do go on to overwinter. In common with many butterflies Comma aberrations do occur. An aberration is where the pattern or colouring does not conform with the normal appearance of a species. 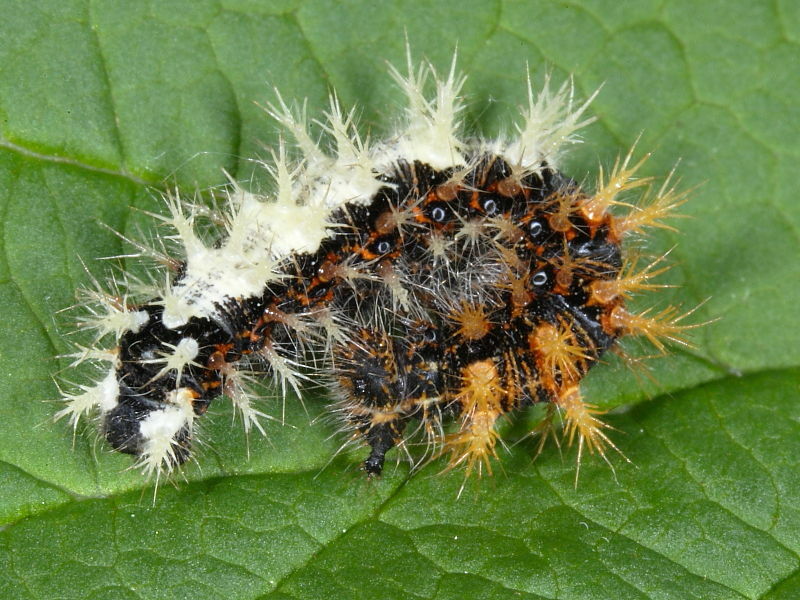 The most striking and one of the rarest aberrations is Comma ab. dilutus as shown. There are two set specimens of this very pale form amongst the Cockayne collection at the Natural History Museum but it seems to be rarely seen today. The image shown is of one recorded on the Cornwall and Devon county boundary in 2008 and is believed to be the first record for both counties. This fine example of the Comma aberration O-album was sighted and photographed by Andrew Jones on Walton Common, Somerset. In this Comma form the distinctive white, comma shaped mark on the underside of the hindwing, from which the Comma derives its English name, forms an irregular shaped oval. 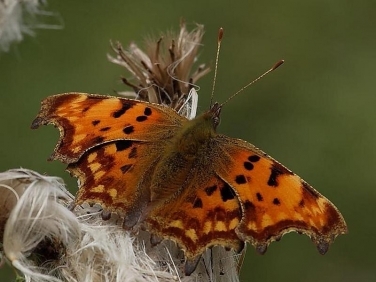 The Comma butterfly has been recorded in every month of the year but the hibernating butterflies, under normal conditions, won’t be seen in flight between November and late February. However, during sunny days, even in the depths of winter, they may warm up sufficiently to wake up from dormancy. This mostly occurs where the butterfly is hibernating in a sheltered place such as a garden shed or a green house which warm up unnaturally quickly in the sun. 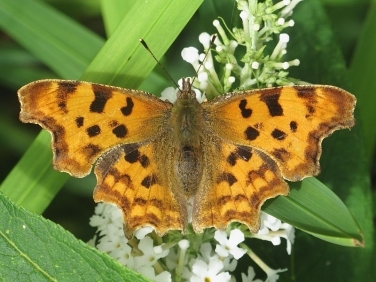 Those butterflies that have survived the winter are one of the earliest butterflies to be seen in the UK, flying between March and the end of May. The offspring of these will emerge between June and July, with the earliest butterflies going on to produce a second generation which will then emerge from late August into September before going on to overwinter. 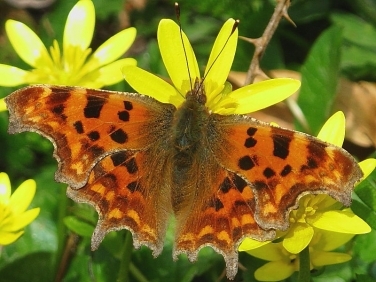 The butterflies will feed on the nectar of a wide range of seasonal flowers throughout the year. Early in the year they will often be seen nectaring on early flowering sallows and heathers, while in the summer Buddliea are a magnet for them and in the autumn late flowering brambles and sedums provide vital energy sources in readiness for hibernation. 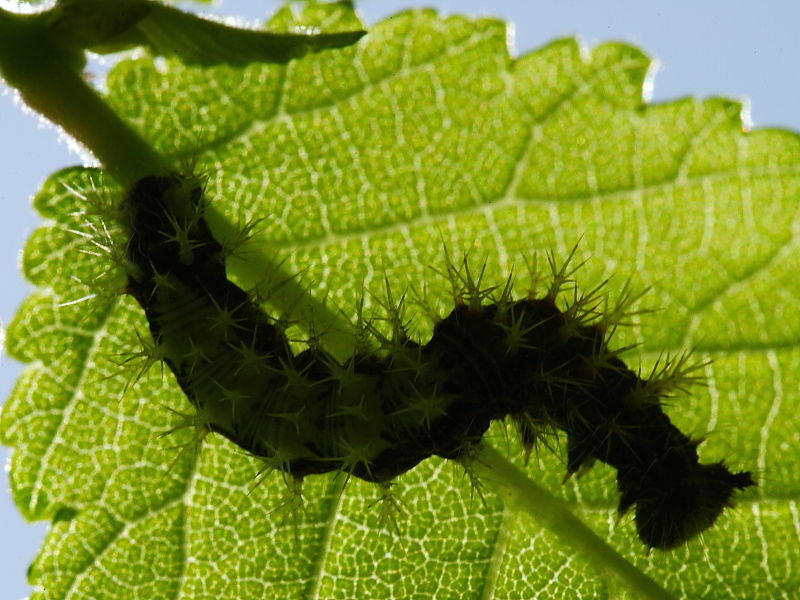 The caterpillar’s main food plants are the Common Nettle and Hops but may also be found on species of Willow, Elms and Currants. The green eggs are laid either singly or in small groups of 2 or 3 on the upper side edge of the leaves of the food plant and hatch within three weeks. At first the caterpillars feed on the underside of leaves but in the later instars the caterpillars resemble bird droppings and may often be found resting on the top of leaves. 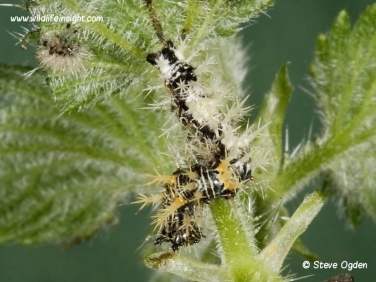 After 6-7 weeks and about 40mm in length the caterpillars are fully grown and ready to pupate. Having selected a suitable place, often amongst the stems and leaves of the food plant it spins a silken pad from which it secures its tail hooks before hanging upside down and completing the pupation transition process over the next couple of days. 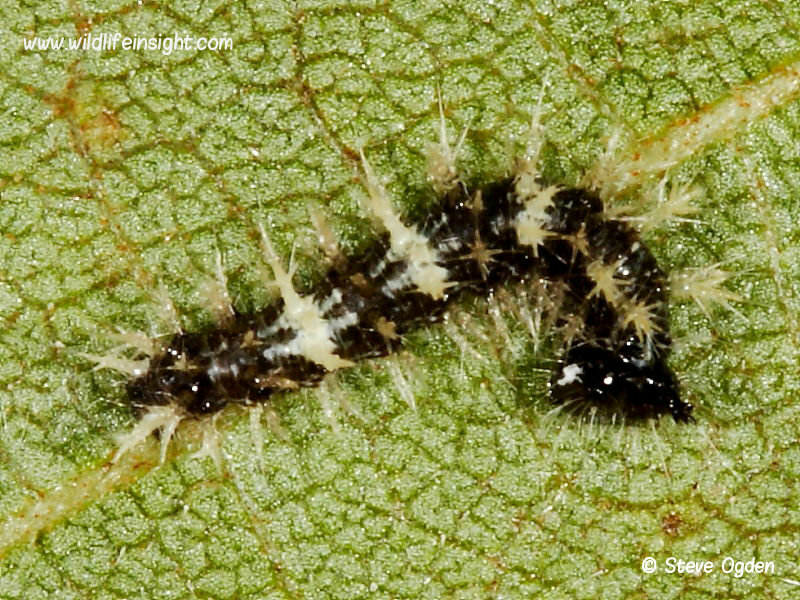 As the pupa darkens it becomes almost indistinguishable from the surrounding withered leaves. The adult butterfly will emerge within three weeks. 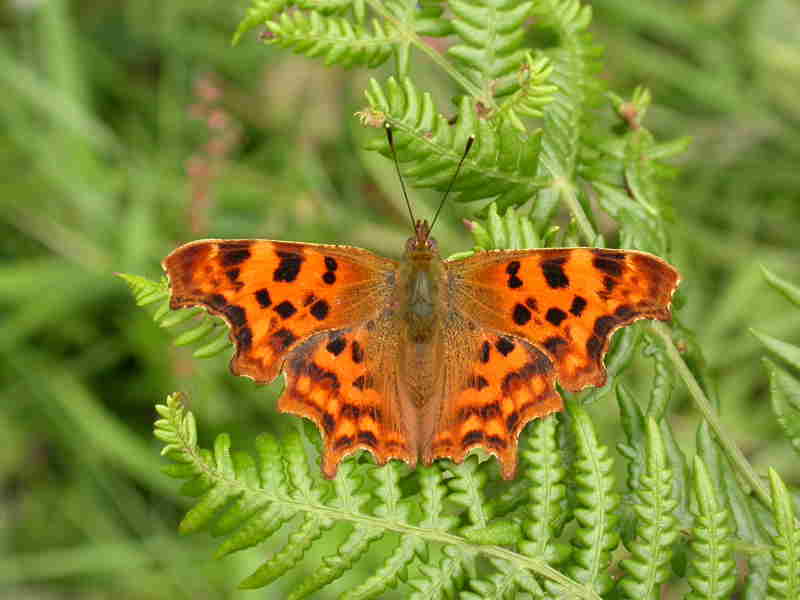 The Comma butterfly is one of the few British Butterflies to be expanding its range. Once restricted mainly to the Midlands and central and eastern parts of southern England it has now spread to the far south west, reaching Cornwall in 1933, and, in more recent years, reaching as far north as Scotland. Climate change is thought to be the main reason for this rapid expansion in its distribution. The Comma butterfly is mainly found on the edge of woodlands but can frequently be found in gardens well stocked with nectar sources. In autumn they can often be seen nectaring on late flowering bramble flowers storing up energy for hibernation. In their natural surroundings they hibernate in bark crevices and hollows of trees but these days they are far more likely to be come across in garden sheds and outhouses. The males are territorial and will often be seen sunning themselves on the same bare piece of ground or tree stump from which they will quickly fly to inspect almost any large insect intruding on its patch. 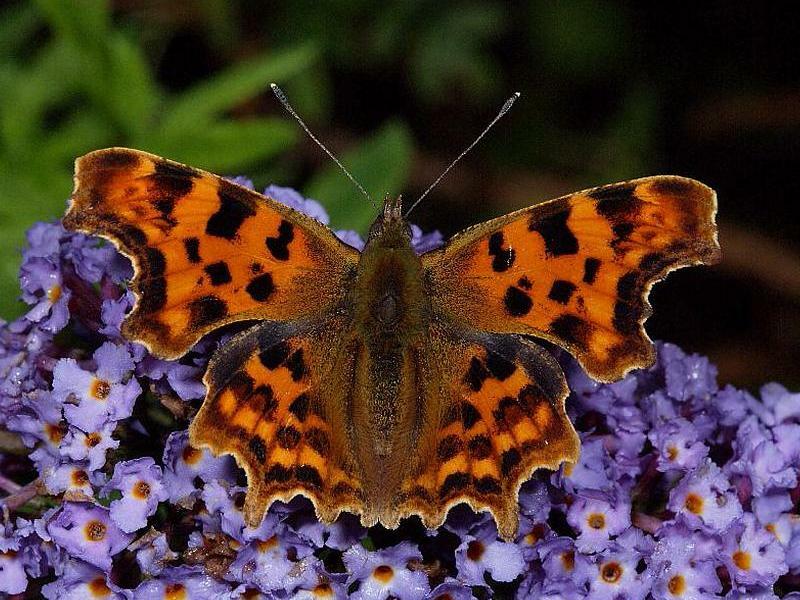 Latest sightings of Comma butterfly.